Let’s keep plugging away here, shall we? This time around on out year-end wrap we’re looking at the top 10 collected editions of 2017, with a slight change to my previously-announced methodology : rather than placing everything “Modern Age” (roughly the 1980s) and beyond in this category, I’ve narrowed it to collections of comics published post-2000, so that everything being referred to as “contemporary” at least comes from, ya know, this century. Apart from that, however, the category remains a fairly broad one : TPB or hardcover collections of single issues, webcomics collections, diary comics collections, and anthologies all fall into what I consider to be “collected editions” — in other words, a lot of this stuff is more or less brand new, and many critics who don’t share my OCD affliction might even call some of these “graphic novels.” I’m not gonna do it that way, though, because my list of the top 10 graphic novels is going to be just that : original graphic novels constructed from the outset to be published as a single volume. That’s it for the particulars, then, apart from a reminder that there may be a couple of tail-end-2016 releases that make their way onto these lists because they hit shops too late to be properly reviewed by yours truly last year, and that each book will be summarized quickly — these are not proper “reviews” or anything of the sort. Okay, let’s do this! 10. Sticks Angelica, Folk Hero by Michael DeForge (Drawn+Quarterly) – DeForge revealed a more whimsical and even, dare I say it, “fun” side in these single-page webcomics, and they read very cohesively as a collection. Absurdist humor, an idiosyncratic protagonist, and a decidedly revisionist take on “funny animals” combine to form a typically singular (there’s a contradiction for you) DeForge reading experience. 9. Sunburning by Keiler Roberts (Koyama Press) – Roberts’ autobio webcomics are a stark look at life’s challenges and its subtle beauty and they balance the joys and drudgeries of parenting with a quiet and unassuming honesty that’s entirely un-sentimental, but not in any way clinical. In addition, her simple-but-detailed illustration draws the eye in to notice every little detail, and there are a lot of details to notice. It’s always a pleasure to see her work collected in print, and this is her strongest book yet. 8. A Process Of Drastically Reducing One’s Expectations by Gabby Schulz (Phase Eight Publishing) – If you know Schulz, you know that this collection of his diary comics won’t be an “easy” read — he doesn’t spell out the particulars of his life with any great specificity, but you can see his mental, physical, and financial deterioration playing out before your eyes in a manner as relentless as it is nonchalant. So, yeah, this is no “easy” read — but it’s a compelling and engrossing one, no doubt about it. 7. Band For Life by Anya Davidson (Fantagraphics) – These chronicles of a multi-species punk band in a sci-fi future Chicago sure seem an awful lot like those of people I knew in my 20s who were in bands, so I guess that means the themes here are timeless, indeed. And Davison herself reflects the never-say-die ethos of her protagonists : after fleeing Vice’s digital sweatshop, she continued posting these strips on her Tumblr page, and finally saw them through to completion in this magnificent hardback collection. 6. Boundless by Jillian Tamaki (Drawn+Quarterly) – Breathtaking illustration, ethereal themes, and naturalistic visual storytelling combine to make this collection of Tamaki’s strips a supremely memorable read, one that analyzes her female progatonists’ complex relationships with themselves, their bodies, their hopes and fears, and their self-image with disarming candor and incredible grace. Stirring, soul-searing stuff. 5. You & A Bike & A Road by Eleanor Davis (Koyama Press) – This travelogue composed of diary strips and single illustrations documenting Davis’ bicycle trip from her parents’ home in Arizona to her adoptive hometown of Athens, Ga. doesn’t chain itself to anything like a traditional narrative framework, instead providing an interpretive, experiential look at a journey every bit as philosophical, even spiritual, as it is physical. Another resoundingly resonant work from someone making a very strong case to be considered the cartoonist of her generation. 4. Mirror Mirror II , edited by Julia Gfrorer and Sean T. Collins (2dcloud) – The second volume of 2dcloud’s annual(-ish) anthology has a loose “horror” theme at its core, buy beyond that editors Gfrorer and Collins really do give their contributors free reign to explore the subject in wide-open, entirely unique ways. And what a group of contributors they’ve got! A unique mix of folks we see a lot of working in other genres (Simon Hanselmann, Josh Simmons), folks whose work typically does tend toward the horrific (Gfrorer, Noel Freibert, Clive Barker — yes, really! ), and folks we just plain don’t get to see anywhere near enough of these days (Al Columbia, Renee French, Dame Darcy, Carol Swain, Nicole Claveloux), all presented in the kind of uncompromisingly high-quality package we’ve come to expect from this premier “boutique” art-comics publisher. This is a book overflowing with both dark beauty and artistic integrity. 3. Providence Acts Two And Three by Alan Moore and Jacen Burrows (Avatar Press) – I’ve raved enough about this series over the last couple of years — but goddamn, it’s so good that I almost feel as if I’ve undersold it. Suffice to say, Moore and Burrows have created what is undoubtedly the smartest, most richly-detailed, most multi-layered horror comic in history. Act Two collects issues 5-8, Act Three finishes the story off with issues 9-12. 2. True Swamp Book 2: Anywhere But In — by Jon Lewis (Uncivilized Books) – Finally collecting Lewis’ two “bumper-sized” issues from the early “aughts,” his second go-round with the foul-mouthed (but hyper-intelligent) Lenny the Frog and his bog-dwelling friends is, if anything, even more funny, smart, and endearing than the first, and far more visually accomplished and experimental. Matching the wit and charm of Walt Kelly’s Pogo with a distinct underground sensibility, there has simply never been another comic like True Swamp — and, chances are, there never will be again. I believe “sublime” is the word we’re looking for. 1. 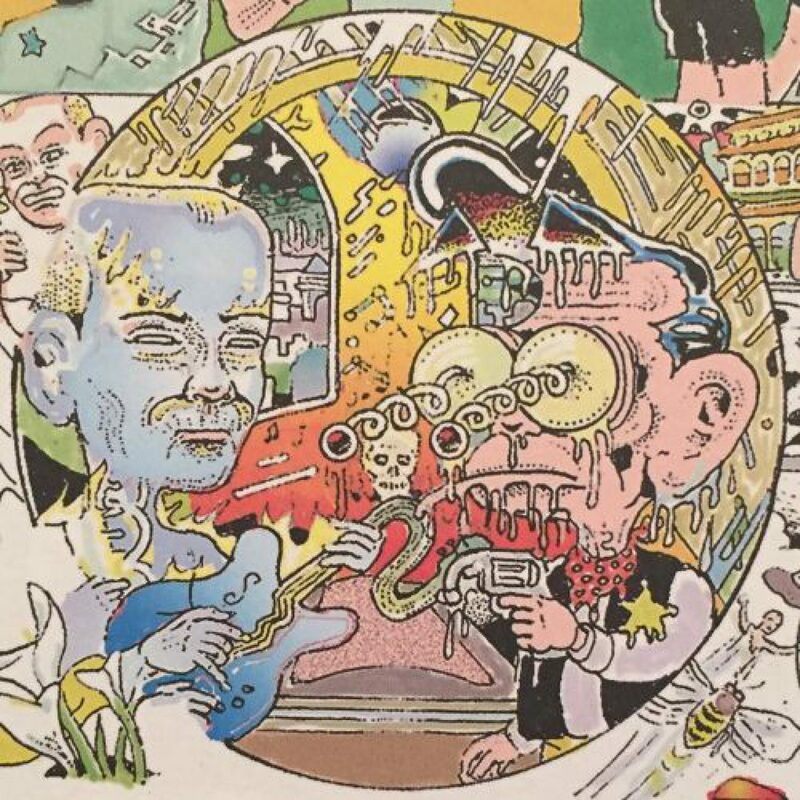 Farmer Ned’s Comics Barn by Gerald Jablonski (Fantagraphics Underground) – At last presented in the oversized format that these dense, information-packed (both visually and verbally) strips pretty much demand, this near-as-we’re-ever-likely-to-get-to-definitive collection of Jablonski’s work showcases his singular genius in a manner his small-but-dedicated legion of fans could only have dreamed of until it finally happened. Utterly unlike any other comics ever even conceived of — much less done — by anyone else, this is a hermetically-sealed universe unto itself where the rules of what “should” or “shouldn’t” work not only don’t apply, but simply don’t matter. Jablonski reigns supreme in his kingdom of one. Okay, looks like that’ll do it! Again, this list seemed like a daunting thing to put together until I started doing it, and then it all came together almost on its own, as if it were just being channeled through me. Freaky, huh? Next up : my picks for the top 10 collections of vintage (as in, pre-2000) comics released in 2017. Hope to see you back here in a couple of days for that one! Again, plenty of great stuff here — so get to reading!